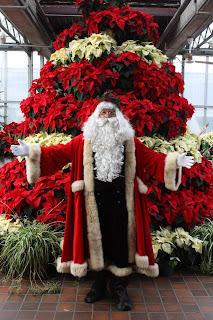 I lived in Burlington for pretty much all my Canadian life (in April we'll have 14 years in the city, while in July we'll have 15 years of Canada) - and it took 13 Christmas seasons to discover an amazing place to visit at Christmas: Royal Botanical Gardens. The gardens are our home during the summer - we spend countless hours hiking through the gardens / forests, we have thousands of pictures with flowers at different stages, we visit the Lilac festival every year (Lilacs are my favourite flowers, more on this later)... yet somehow I never ever got to RBG at Christmas time. This year, due to a Facebook post with a picture of a wonderful Santa, we have decided to pay a visit (we live 10 minutes away anyhow). Easy said, easy done - while coming back from a concert we stopped at Royal Botanical Gardens. As soon as we passed the customer service, we met him: a tall Santa, dressed in the most elegant costume, with a wonderful beard and a great smile. He stopped, shook hands with my son, smiled beautifully and continued on his way. I was beyond charmed - I got used to different types of Santa, everywhere - however this one is just taken straight out of those old books of Christmas stories. And you should see his place inside the RBG... his chair... oh, dear! We passed his shop and arrived in the heart of RBG where they got not one, but two rooms with trains! 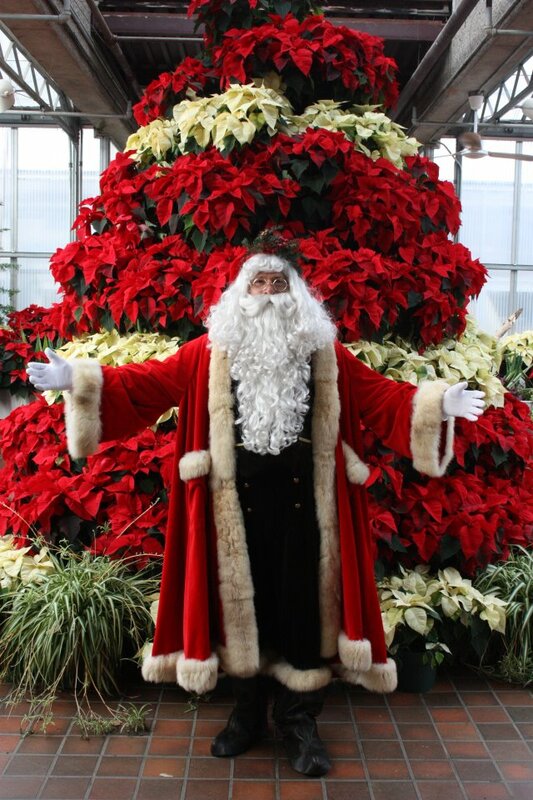 One display is built around bulbs: to see Thomas The Tank Engine and a couple of other (non-Thomasy) engines choo-choo-ing around white daffodils and poinsettias - that's an amazing sight for an adult, let alone a child! And the display in the back room - with large engines and miniature Go Train and train cars full of gifts... the whole place is magical! To top it off - in the central garden they have a pair of... reindeer! Real reindeer! And of course, when you ask where do they come from, the answer is - from the North Pole! Apparently there is a farm few km north of here where they raise reindeer. What do they use them for the rest of the year? Nothing - they keep them solely for displaying during the Christmas season. I also learned they are the oldest domesticated animals on Earth (had no idea) and that there are no more wild reindeer anywhere in the world (not even in Finland, where they come from). Is there another place in the GTA where we should visit now? Before decorations come down?